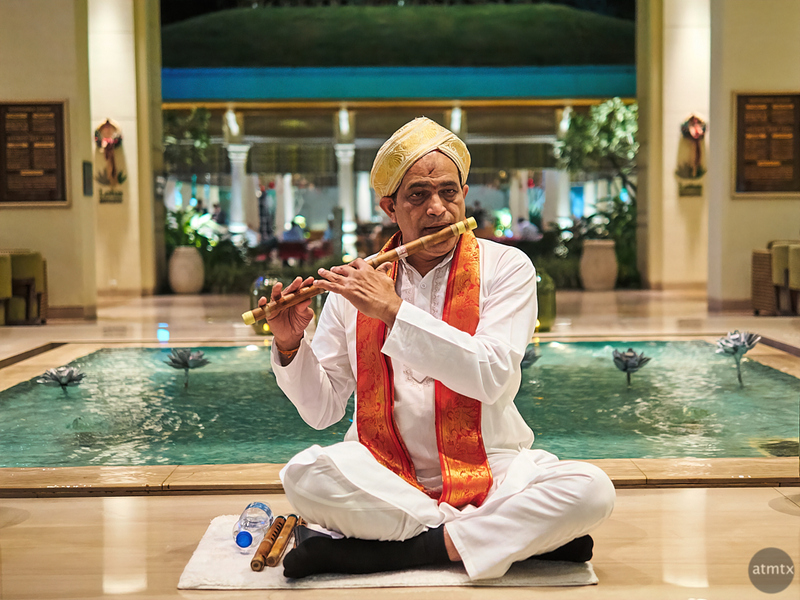 The gentle melodic sounds I heard at ITC Gardenia were not a recording. I noticed this flautist sitting by the fountain in the center of the lobby. He wasn’t always there, but I noticed him playing on a couple of nights. The Aloft featured a talented performer singing hit music covers, but the traditional flautist seemed more in keeping with the upscale Gardenia. I mentioned that the hotel presented me with a scarf, upon check-in. While mine was purple, the design matches what this musician is wearing. In fact, the scarf I received six years ago looks very much like this orange version. I’m not sure of the material but has a silk like appearance. The lobby was darker than I remember, looking at the exposure details. At f1.4 on my Olympus PEN, at 1/60 of a second, I was at ISO 2500. You might have noticed that I used my compact Canon G7X Mark II quite a bit during this trip. But, when it comes to the serious photos, I always gravitate towards the more capable Olympus cameras. It handles the dark a lot better and, for portraits, it nicely blurs the background. It doesn’t produce the extreme shallow depth of field of a full frame camera, but I think it gives the perfect balance of environmental context and background softening. I have enjoyed your series on Bangalore. As it turns out, I do the bookkeeping for our church’s missionaries to India; and as your series has been appearing during the month of January, our 2 missionaries have been in south India, including Bangalore. I forwarded a few of your messages to one of them because they see the lower economic side of the city. Hi Kalendaj2013, I’m glad you like the series. Anything that increases understanding around the world is a good thing. Thanks for sharing my posts.